Posted by todd under: Crashes; Raleigh Super Course . I will ride in any kind of weather, but I will not ride on ice, I tell people. On this night, I remembered why. Thank God my leg was not broken, so I could kick myself. About two weeks ago, I rode in through the rain (nothing unusual). The temperature dropped while I was at work. Alongside Commonwealth Stadium, approaching Alumni Drive, there’s an asphalt walking path. It’s smooth, and it declines slightly — a perfect place to accelerate. Out of habit, that’s what I did. — The tire was skidding. — I was not slowing down. — The front wheel was turning. — I was about to make intimate contact with the pavement. The wheel slid such that it was at about a 90 degree angle to the frame, and over the bars I went. Well, almost all the way over the bars — I sort of got hung up on the bars, and landed on my right side. I got up and rode home none the worse for wear. Again, it could have been much worse. It’s easy to sprain or break a wrist, or break an arm, in this type of a wreck. What did I do wrong? I didn’t follow my own advice — go slowly when there’s a chance of ice. When I did figure out I was on ice (which was before I braked, by the way), I should have guided the bike onto the grass before stopping. 24 June 2010 at 9:32 pm. Old post, I know, but if you reliably get ice (we do on the trail here near Boston) there’s a lot to be said for (carbide) studded snow tires. I prefer Nokian, of the ones I’ve tried, I like Nokian 240s best. If you don’t often get ice, I’m not sure it’s worth it, because they add some rolling resistance. Yes, that's me, Todd Van Campen. No, I'm not wearing a helmet. Yes, I usually wear one, so please don't scold! Seriously, I endorse wearing a helmet! Pinky swear! In fact, I almost ALWAYS wear one (while riding a bike anyway). (On the other hand, if YOU don't want to wear a helmet, I have no problem with it.) I don't remember what happened on this particular day. Fortunately for all of us it makes for a less-nerdly picture. My exceptionally talented professional photographer friend Charles Bertram took this photo. 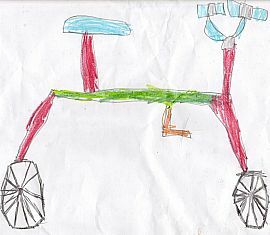 I asked my 6-year-old son, Caleb, an avid bicyclist and artist, to draw a bike for me. I think he did a great job! The 6-Miler is powered by WordPress and uses the Autumn Concept 1.0 theme created by Ed Merritt.